The killer theme park haunted attractions featured in the upcoming Halloween horror film Hell Fest will be brought life in the real world at three Six Flags parks this fall during their annual Fright Fest event. Read on for the official press release. CBS Films today announced an exclusive national partnership to provide Six Flags guests with a unique experience in support of CBS Films and Lionsgate’s latest horror movie release, Hell Fest, in theaters Friday, September 28, 2018. In collaboration with Hell Fest creators, Six Flags and CBS Films are launching new haunted attractions based on the movie at three Six Flags theme parks this Fright Fest. The company’s industry leading entertainment teams at Six Flags Magic Mountain in Valencia, CA, Six Flags Great Adventure in Jackson, NJ, and Six Flags Great America in Gurnee, IL, will transform haunted mazes into real life replicas of the movie’s most unnerving, goriest, and most epic scenes. Six Flags will also promote the movie’s nationwide release through Six Flags Media Networks platforms, including Nielsen measured Six Flags TV. Fright Fest runs Fridays, Saturdays and Sundays from September 15 through October 31. Operating schedules vary by park. For more information, visit sixflags.com. 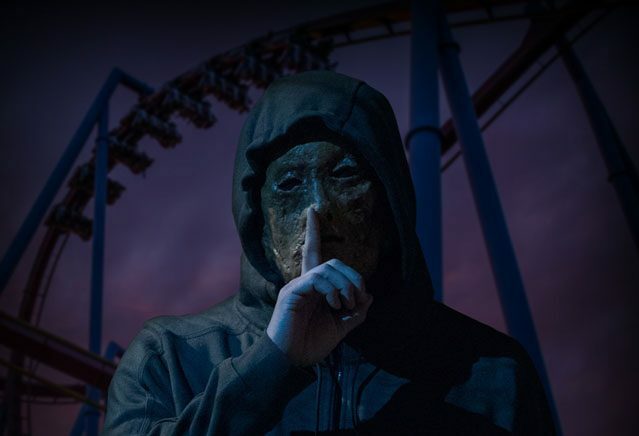 Hell Fest is set at a theme park during Halloween, where a night of fun turns deadly as a costumed killer begins slaying unsuspecting patrons who believe that it’s all part of the festivities. The film stars Bex Taylor-Klaus (Scream: The TV Series, Arrow), Amy Forsythe, Reign Edwards, Christian James, and genre icon Tony Todd (Candyman, The Crow, Final Destination, Hatchet), directed by Gregory Plotkin (Paranormal Activity: The Ghost Dimension; editor of Get Out, Happy Death Day) and executive produced by Gale Anne Hurd (The Walking Dead). Hell Fest opens in theaters on September 28. You can watch the official trailer for Hell Fest and view a new poster for the Fright Fest event, featuring our newest Halloween horror icon The Other, below.